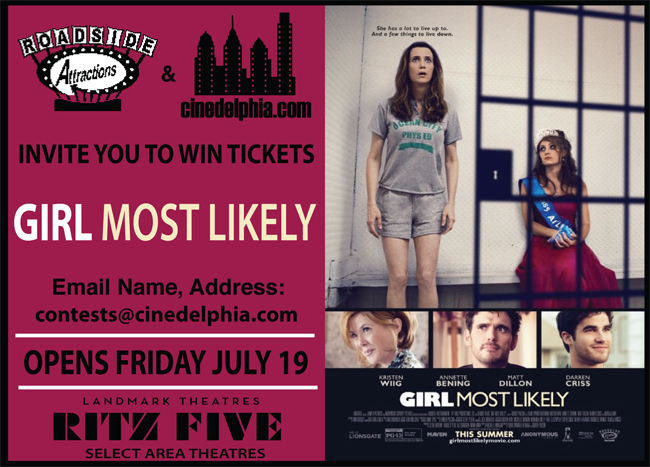 We’re giving away a bunch of pairs of movie tickets to see Girl Most Likely at the Ritz Five. To enter, e-mail us your mailing address. Winners will be chosen at random, only one entry per household please. Kristen Wiig stars as Imogene, a failed New York playwright awkwardly navigating the transition from Next Big Thing to Last Year’s News. After both her career and relationship hit the skids, she’s forced to make the humiliating move back home to New Jersey with her eccentric mother and younger brother (Annette Bening and Christopher Fitzgerald). Adding further insult to injury, there’s a strange man sleeping in her old bedroom (Darren Criss) and an even stranger man sleeping in her mother’s bed (Matt Dillon). Through it all, Imogene eventually realizes that as part of her rebuilding process she must finally come to love and accept both her family and her Jersey roots if she’s ever going to be stable enough to get the hell away from them. Kristen Wiig is there anything else that needs to be said. If i’m lucky enough to win I KNOW my side will be hurting!! !